Windows 10: The Fastest Adopted OS In Microsoft History? When Microsoft first released Windows 10, the software giant, as well as industry analysts, expected it to become the fastest adopted operating system in Windows history. A few months after the release (October 2015), Microsoft touted huge business adoption numbers: more than 110 million devices had already upgraded, including eight million business PCs. However, most of the initial bump was due to the free upgrade option Microsoft offered. 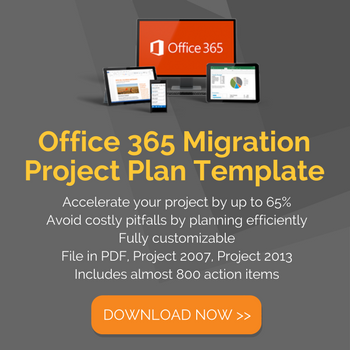 33% of companies planned to migrate within the first 1-2 years. In a widely cited report from November 2015, Gartner even called "Windows 10 [...] the most widely installed version of Windows ever" — predicting that "50% of enterprises will have started Windows 10 deployments by January 2017." And the adoption numbers looked great. Already in January 2016, Microsoft announced it had reached their 200 million activated devices milestone — which meant that Windows 10 adoption had outpaced Windows 7 by approximately 140% and Windows 8 by nearly 400%! While the majority of these devices were consumers, Microsoft Senior Vice President, Yusuf Mehdi, was very optimistic: "As of today, more than 76% of our enterprise customers are in active pilots of Windows 10, and we now have over 22 million devices running Windows 10 across enterprise and education customers." March 2016: Microsoft said that it added an extra 70 million newly activated devices, bringing the total to 270 million. June 2016: The total of active Windows 10 devices is now 350 million. September 2016: Windows 10 surpasses the "active on over 400 million devices" milestone. Traditionally, enterprises wait 12-18 months after a major OS release before testing and evaluating it to give it time to mature on the market to avoid large-scale business disruption. It's generally only after 24 months that the broader rollout within larger organizations takes place. Almost two years later, enterprise adoption should have been in its hottest phase according to previous predictions — but enterprises were dragging their feet. According to a 2017 Spiceworks study, "60% of businesses across the globe had installed Windows 10 on one or more computers on their network", and more than 2 out of 3 business laptops and other devices were still running on Windows 7, the seven-year-old Microsoft operating system that will go end-of-life early 2020. 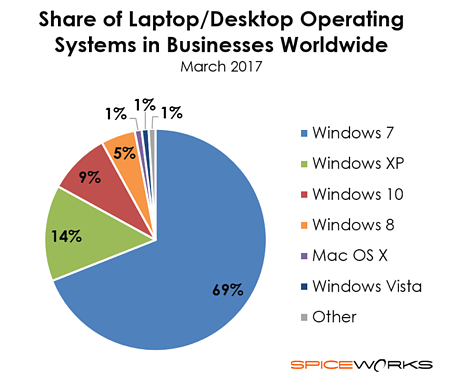 Moreover, 14% of business devices were still on Windows XP as of March 2017 — costing organizations millions of dollars for Windows XP extended support despite Windows 7 being the standard OS. Analyst companies continue to be optimistic. Gartner published the results of a survey in April 2017 stating that "85% of enterprises will have started Windows 10 deployments by the end of 2017", citing growing security concerns as the main driver for enterprises. By October 2017, the overall adoption has reached 500 million monthly active devices. 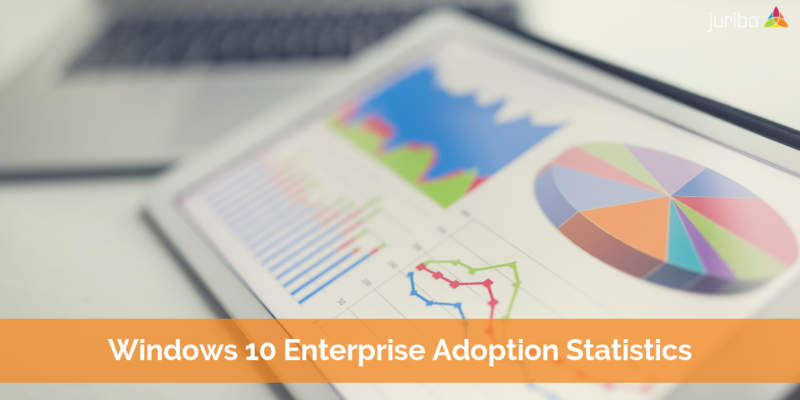 According to a Forrester's survey of almost 500 enterprises, 34% of company-issued PCs are running Windows 10. Also, Microsoft touts a 90% growth in commercial devices year over year. While these numbers without context sound great, they fell far beyond expectations and Windows 7 enterprise adoption, which is still the most prevalent OS in business environments. But what is holding them back? To answer that question, the online industry publication, Petri, talked to more than 50 IT Pros in small, medium and enterprise-size companies. There was one common thread to their concerns about migrating from Windows 7 to 10: The Windows-as-a-Service Servicing Model and the required switch to Evergreen IT! In an emotional email posted on LinkedIn on March 29th 2018, the outgoing Terry Myerson reminisced on his 21-year career with Microsoft and mentioned the company is "now approaching 700 million active Windows 10 users, [and] commercial usage is growing 84% year over year." This number was later confirmed in the Q4 FY'18 analyst call on July 19, 2018. +90% of Fortune 500 use Microsoft Cloud. While 700 million is still a far way to go to 1 billion devices, it is a substantial feat. When Microsoft introduced its brand-new Windows-as-a-Service, it was hoping for record-setting adoption in general, and among enterprises in particular. Initially fueled by free upgrade offers, and later forced by no or limited deferral options, the numbers looked promising. However, soon enterprises struggled to understand and keep up with the ever-changing Windows 10 Servicing concept and timelines — and put on the brakes. As usual, it will be the compelling end of life event for Windows 7 in January 2020 and threat of an expensive custom support agreement that will drive the highest enterprise adoption. 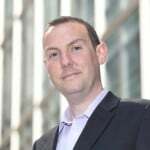 With Microsoft still finding its feet on the stability of the upgrade process, enterprises may well argue that they are being forced into a model that is not quite ready for prime time. However, there is no stopping this particular momentum, and the next 12 months will show how the change of support to 18 months for Spring Updates and 30 months for Fall Updates as well as the Microsoft Managed Desktop offering will impact enterprise adoption.